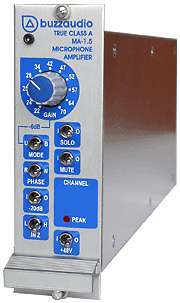 As of Jan 2017 the A-RACK has been discontinued, but you may be interested in the QSP-20 4 channel mic preamp. The A-Rack 8+1 frame can house up to 9 of our MA-1.5 mic preamp modules. These modules contain pretty much the same circuitry as our True Class A MA-2.2 microphone amplifier except the output is electronically balanced. The A-Rack is designed for multi channel recording setups and the MA-1.5 preamp delivers a unique punchy and detailed sound for the discerning sound engineer. The non-reactive transformerless input stage of this design means the MA-1.5 preamp works well with all microphone types and there is plenty of low noise gain available. The A-Rack is in use by many broadcasters around the world including Radio New Zealand, the Canadian Broadcasting Corporation and the reknown production company Fogolabs where it has been used to record well known musicians and concerts. The A-Rack includes a headphone monitoring system so that signals on each channel can be checked and the 20 segment meter displays peak channel level. The solo monitor system of 2 or more A-Racks can be linked together for ease of use. The solo buss is also available on a balanced output so it can be used as a mono mixer. As well as individual outputs on XLR, channels 1-8 are also wired to a rear DB-25 connector for easy interface to your recorder. Controls are provided for gain, 20dB input pad, output mode (balanced or unbalanced), high or low input impedance, 48V on/off and solo. The A-Rack power supply transformer is supplied in a separate enclosure to ensure lowest noise. Please note the A-Rack system is not compatible with the 500 Series format. GAIN - 41 detent pot the sets gain from 22 to 70dB. SOLO - sends the output signal to the solo mix buss. MODE - changes the output from balanced to unbalanced if driving an unbalanced input. MUTE - switches off the module ouput signal. Phase - changes the polarity of the input signal. -20dB - introduces 20dB of attenuation at the input for high level signals. IN Z - changes the input impedance as seem by the connected microphone. +48V - switches on the phantom power. Maximum Output Level; +32dBu in Bal Mode, +24dBu Unbal Mode. Frequency Response; 2Hz to 250kHz @ 20dB gain (-3dB). 20Hz to 250kHz @ 65dB gain (-3dB). Harmonic Distortion; less than 0.008%100Hz to 10kHz. Slew Rate; typically 140 V/uS, @ +20dBu output level. Equivalent Input Noise; -133.5dB A wtg, 150ohm source Z. Signal to Noise Ratio; -74dB A wtg, input shorted. Common Mode Noise Rejection; 100Hz-80dB, 1kHz -80dB, 10kHz-70dB internal trimmed. Module to Module Crosstalk; below noise. Input Impedance; 3k ohms/1k2 ohms switchable. Size; DIN 41612 standard 8 HP wide. Power requirements; must be fitted into A-RACK module rack bin.